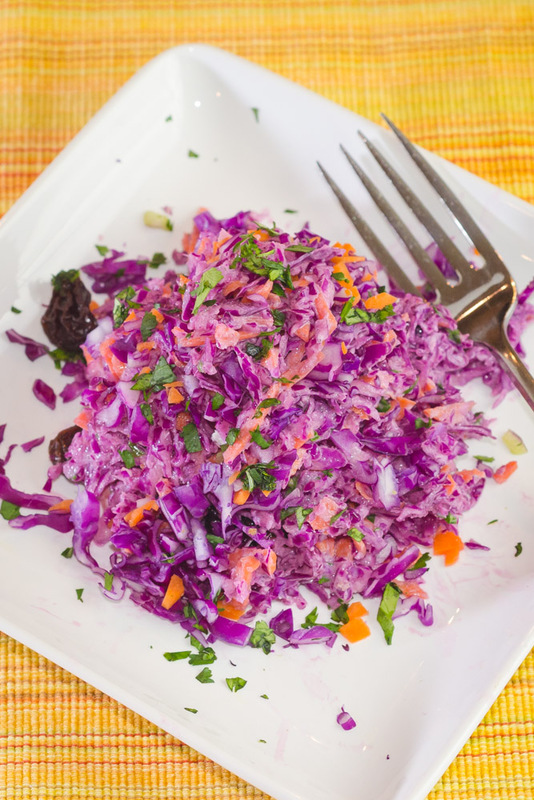 How often do you find yourself with a head of red cabbage where you’ve only used a portion of it? 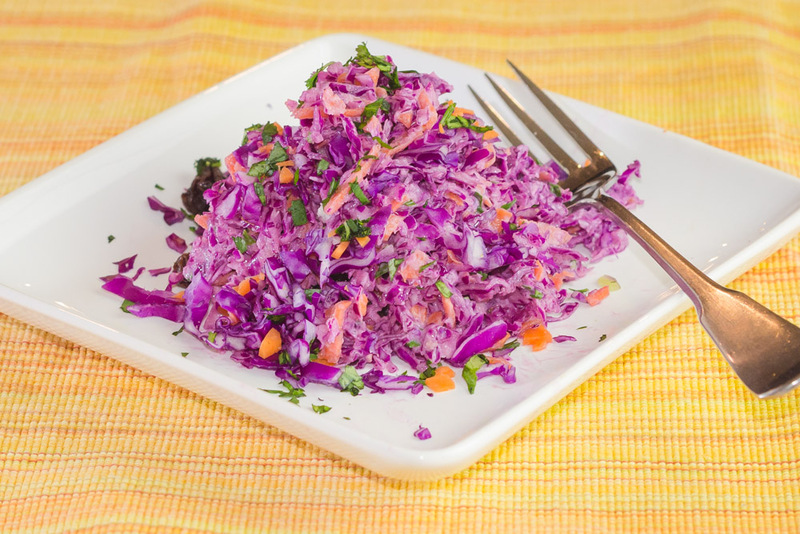 A good sized head of cabbage yields a lot of shredded goodness. Whether you have one from your CSA, or picked one up just to use a small amount for some tasty fish tacos, here’s an idea for how to use what remains. First off, if you don’t have a large box grater, you should probably pick one up. The one I have from Oxo not only has their trademark grip, but it also has a container that attaches to the bottom to catch the output.This was an idea I had that made great use of a couple of odds and ends I had in the refrigerator that needed to be put to use. Half a head of red cabbage, some remaining carrots, cilantro leftover from making guacamole and a single container of greek yogurt. I was looking for something that would pair well with an Indian spiced dish, lentil veggie burgers, that I was making. 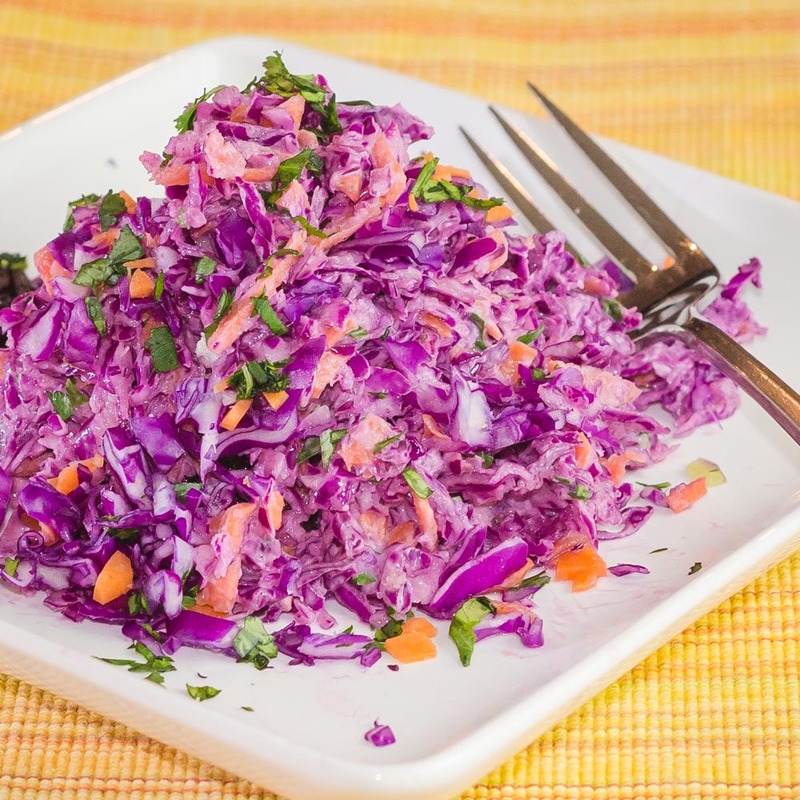 The carrot and cabbage would give some crunch to the dish and the yogurt ideally would help balance the spices. It’d also add in some nice color as well. The dressing was pretty easy. Take a nice juicy lemon (or lime) and squeeze out about 1 tablespoon’s worth. I always wash anything I’m going to cut open under warm, soapy water first. You don’t know what’s on the surface of the fruit….and you don’t want your knife to spread it around when it slices through. Simply mix the juice, yogurt and some cilantro together. Depending on your yogurt, if you find that it’s a bit too tart, add in a drizzle of honey to sweeten it up. The rest is equally straightforward. Start with the cabbage in a large mixing bowl. Toss in the carrots, raisins and cilantro until you like the ratios. Finish by tossing in the dressing. Mix the yogurt, lemon juice and 1 tablespoon of cilantro together in a small bowl. Salt and pepper to taste.